Copper River Salmon when home . “Lambi” , ( conch) , in the islands . No farmed fish. Guck . Ling. ( Red Hake) Just had some the other day a bud dropped off. These are rarely offered in fish markets because the flesh turns mushy very quickly. Fresh caught locally, they offer a buttery, flavorful flesh. We love 'em. They are long and skinny; sort of like a fat eel and nearly as slimy. They don't fight much. But, oh, so good. Here's my bud, Mike, with a medium sized one. Looks like you have a different species you call Ling. We catch ling in the Irish Sea. About the only thing locally that carries any notoriety would be Fanny Bay Oysters. I think they are the same species, Nick. They vary in color somewhat, depending upon the bottom composition and time of year. Also, they will tend to get a silver/grey cast ( like many fish) after being deaded and iced. Are Prairie Oysters not local to you? I suppose they could be, but I wouldn't eat that food even if I could see it! I’ve had smoked Mississippi catfish and carp. It’s pretty good! One genuine Winnipeg specialty is smoked goldeye (Hiodon tergisus). Saltwater ling in the Atlantic is probably common ling, Molva molva. 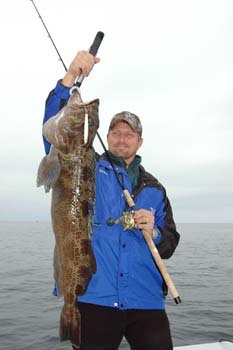 Freshwater ling cod, aka burbot and a whole bunch of other names, is the closely related Lota lota. Not sure what that west coast one would be. While I've seen it mentioned in lists, I have to shout out halibut. Fantastic flavor - though not cheap. Here in VT, ice fishing produces tons of perch. Fried up (usually breaded & deep fried) it is very tasty. Then there are brookies (trout) fried in some butter in a cast iron pan over an open fire when camping. Doesn't get any better than that. It was in one of my links. Never seen the latin name before: Ophiodon elongatus. I caught a 24" King salmon last night, and had it for dinner an hour later. Living the good life. Some variation of this was quite common when I lived in Astoria. Various types of salmon. And oysters, steelhead, razor clams, sturgeon, mussels, and halibut. Now, living in Portland, I'm mostly dependent upon the fishmongers - unless a buddy drops by with a care package. Saltwater ling in the Atlantic is probably common ling, Molva molva. Where are our poets? This Hake deserves a haiku! And an excellent meal it does make. Last edited by BrianY; 04-11-2019 at 02:24 PM. I have to admit that I am a fresh fish snob and though I love fishing and do a lot of it I won't bring any home to put in the freezer. Mostly it's catch and release but I will keep a couple for a fresh meal at times, often as shore lunch or a late brunch after fishing the morning. As Cris and Keith stated Walleye is king here in Minnesota for eating but my wife likes Crappies and panfish so sometimes I will filet enough of those to keep her happy. Walleyes are often active after dark or in low light conditions. Trego believes in taste and release fishing. Early fall Walleye, Voyageurs National Park. Last edited by hnsbrc; 04-11-2019 at 02:38 PM. Oh, THAT one. That's the problem with colloquial names for fish - the older names tend to be shared by a bunch of species. Around here they are often known as "pickerel", which is a bit daft by my standards (hellooooo, Esox niger! ), but whatever. Pickerel cheeks are a delicacy akin to scallops. Our best known would be Cromer crabs and then there are the inevitable cockles and whelks (which go really well with garlic mayonnaise if you get the chance to try them) and then there are the usual inshore fish.Sea trout crop up from time to time and there are soles inshore if the fishermen know where to look.Still some herring around in season,but they are a hard sell these days and our Dutch neighbours are happy to get them. Pickerel is the name I know from my youth as well, so I try to stick to Walleye now. Because people look at you funny when they think you're telling them Pike is a tasty fish. Four years in Maine, I ate an average of ten lobsters a week when I was on the coast. I knew a lot of lobster boat haulers and often gave them to me for free. I went home one weekend and mt parents welcomed me and said they were going out for lobster! Let me tell ya, that rare cheeseburger tasted great. In terms of commercial seafood you can get lobster year round, although it is pricey and a bit harder to find in the winter. Local scallops are only available fresh during the season (late November through Mid April). Haddock, halibut, hake, swordfish, tuna and very occasionally cod are available, but the quality is generally pretty poor locally since most fish are landed down south (Portland) and "fresh" fish is anywhere from a 3-4 days to weeks old when it gets here. You an also get crab meat (you can only buy whole crabs direct from fishers not in the stores). Clams, muscles and oysters are available, but risky due to frequent wide spread closures. There hasn't been a shimp fishery in Maine for quite a few years. Atlantic salmon is also available, but it is hard to get the local stuff since it comes from all over the place (Canada, Norway, etc.). In my opinion farmed Atlantic Salmon is too fatty and not worth buying. I do get some each year directly from the local salmon farm. That fish is better than what you can buy in the store simply because it is fresh - still alive when you get it. A great deal of the fish sold in the stores is FAS (frozen at sea) although it is sold thawed. The local fish monger gets his fish from the same supplier as the grocery store. As far as recreational fishing goes, you can catch trout in the local lakes and streams. Ocean fishing is much more limited. The only fish you can catch reliably is mackerel. You can occasionally catch small pollock or cod. I know people who catch halibut and tuna, but that requires a boat that can go out 25 to 50 miles and many people go for years without catching a tuna. In general the local waters are pretty fished out. In general the quality of local seafood is poor except for lobster and scallops in the winter. Helping a friend bring a boat from the Abacos to New York, we caught a 35-40 lb. blackfin tuna. Only 5 of us aboard. First & last time I had to stop eating tuna sashimi because I was too full. I need to define what I mean with local. Within 30 nautical miles up or down the coast and within sight of land and within easy walking distance from the shore and within easy rowing distance upriver. Strömming=Herring Traditionally salted in firkins by the fishermen at their camps before bringing the salt fish home. Nowadays often fresh or frozen. Eaten fried or boiled or smoked or baked in oven or anything in between in many dozens of varieties. Anything from salt herrings boiled with potatoes to the most elaborate dishes. Fermented herring was popular in times long gone they say but the practice died out many generations ago. On the Swedish coast some 50 nautical miles to the west they still uphold the tradition and eat it with flat bread and potatoes. We quit fishing herring for househiold needs and quit eating herring a couple of years ago. Many others did too. I miss the taste. The herring got too poisoned with borate fire retardants. Those chemicals should be strictly controlled worldwide. Mankind is a part of the food chain whether we want it or not with herring as a very important part of the diet. One can almost say that mankind spread north to eat herring. Man has eaten herring for as long as there has been a Baltic sea for the herring to live in and any Homo Sapiens around to eat it. If you cannot eat herring without risking your health it is more than time to stop pollution! Sik=Whitefish Fried or smoked or baked in oven or used in more elaborate dishes. Smoked is best. Makes wonderful fish soup with potatoes and carrots and peas. I like fish soup and smoked whitefish is one of my absolute favorites. Gädda=Pike Made to fish balls or fried or baked in oven. By far best as fish balls. Woderfully tasty fish balls with onions. One of my favourite foods. The biggest pikes taste sawdust and are only good for animal fodder. A few still make lutefisk the old way from dried pike and birch ash. 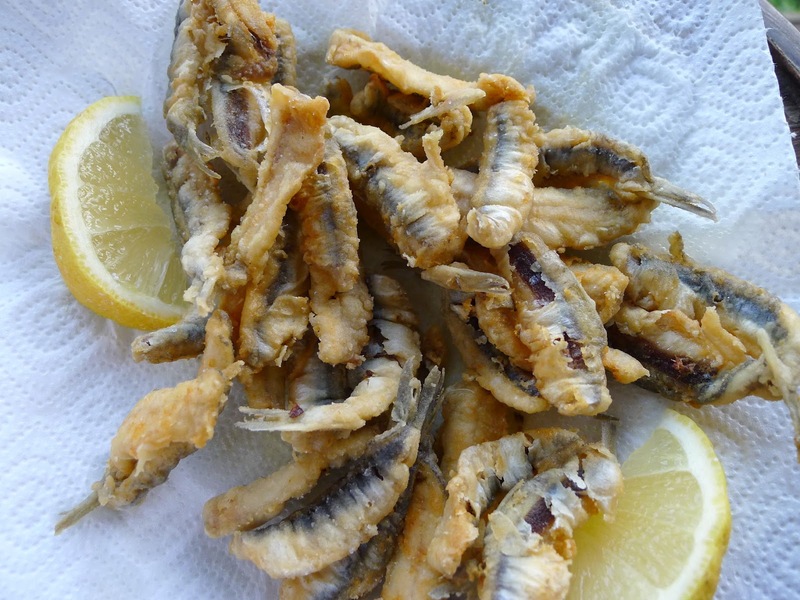 Abborre=Perch Fried or smoked. Both are good. Some boil them in the same kettle as the potatoes. Gös=Pikeperch Usually fried. A delicacy. Braxen=Bream Smoked. Usually goes to animal fodder theese days but as late as the 60-ies it was a staple food in early summer. Gråsäl=Grey seal Used as any meat. Makes wonderful meatballs they say. Vikare=Ringed seal Used as any meat. Makes wonderful meatballs they say. Nejonöga=Lamprey No idea how they eat those things but they say lamprey is a delicacy. Personally I prefere to live in doubt. And when you are fortunate enough to catch one the occasional wild lax=salmon or öring=salmon trout you eat and enjoy but the commercially caugt ones go for high prices to the rich. They are usually fried or smoked. Of cause there is lots farmed lax=salmon available in any amount in every supermarket but it tastes of the same bone meal fodder as farmed salmon from anywhere else and is not worthy of mentioning as seafood only as a functional protein fodder for humans. Farmed salmon seems to be a staple in modern cooking and can be used in any number of ways. In my oppinion it is tasty only as fish soup with potatoes and carrots and peas and so on. In any other form I eat it as bulk protein. A few people eat mört=roach and id=ide and siklöja (a very very small species of whitefish eaten whole bones and intestines and all) but to most of us they are only animal fodder. In the past people ate simpa=horn sculpin and ruda (a very small and bony carp) especially during hard times. Vassrötter=reed roots dredged out of the mud at river mouths and in shallow bays using long handled hooks and then dried and ground to a starch rich flour which could be mixed with either real flour or flour from the dried inner bark of scot's pine trees and baked to bread or boiled to porridge saved the life and health of lots of people during the "poor years" in the 1860-ies. Reed roots are nutricious and pine bark flour isn't bad either according to modern science but the processing is too laborious to make it anything but an an emergency backup...... let's hope that we will never again have any such emergencies. Reed roots is the only local vegetable seafood that I can think of. There is also kräfta=crayfish in a few rivers just north of my geographic limits but they are too few to catch nowadays. In the early to mid 1900-s they were more plentiful and when people who lived close by those rivers took a break from working they often sat down by the river bank and tried to catch some crayfish. It was relaxing and a suitable activity during breaks from proper work. The crayfish was sold apiece to village shopkeepers who sold them througs delis in the big cities as posh delicacis for the upper crust. Crayfish wasn't eaten locally. Last edited by heimlaga; 04-11-2019 at 04:16 PM. My fishing uncle had a Mittle-European recipe for planked carp. Stuff a carp with shredded carrot, onion and celery. Staple it to a cedar shingle. Prop up facing a moderate campfire. Bast it with butter. (Just like a shad roast.) When flaky, throw away the fish and eat the shingle. Fresh caught anchovies which I catch using a cast net. Salmon if we are lucky. There is always crab when in season. Last edited by Ted Hoppe; 04-11-2019 at 04:28 PM. Smelt. Haven’t seen them mentioned yet. Pretty tasty. I got all the farmed eastern oysters I could eat this winter on my $6 shell fishing permit so on the half shell with Meyer lemon juice first, oyster stew second. In summer I used to be able to catch bluefish which I either baked in white wine and butter or smoked. I love swordfish but no longer eat it because it is way too far up the food chain and full of poisons. Chicken lobsters are very weak in flavor and 2 pounders cost an amazing amount per lb since they’re no longer native. So much for local seafood on Cape Cod. A great local fishmonger with local caught is [COLOR=rgba(0, 0, 0, 0.870588235294118)]Jon's Fish Market in Dana Point Wharf. If the fish has green stuff around it, or carpet on the floor it ain't a fish market, it's a fish boutique. They screw up tuna steaks? Bastards!